Primates have long been noted to have more convergent orbital apertures than most other mammals. Early explanations related convergence to arbore-ality (Elliot Smith, 1924; Le Gros Clark, 1959; Wood Jones, 1916). However, comparisons with other animals suggested to Cartmill (1970, 1972) that convergent orbits facilitated visual predation on insects in the fine branches of the shrub layer of tropical rainforests. 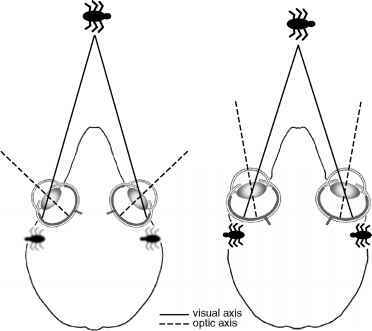 Cartmill argued that "Stereoptic integration of the two visual fields improves the accuracy of the final strike; increase in visual-field overlap facilitates compensation for evasive movements of the prey" (1972: 113). Cartmill's hypothesis did not specify whether these first primates were diurnal, nocturnal, crepuscular, or cathe-meral, and it was left to Jack Pettigrew and John Allman to round out the visual predation hypothesis, specifying nocturnality as an essential part of the argument (Cartmill, 1992). Pettigrew (cited by Allman, 1977: p. 29; Pettigrew, 1978) and Allman (1977) pointed out that the dioptric benefits of orbital convergence accrue to nocturnal rather than diurnal animals. The optical axis is the axis of the dioptric apparatus of the eye (i.e., lens and cornea), around which image quality is highest, whereas the visual axis is the "physiological line of fixation" (Walls, 1942: 292), approximated by a line passing through the center of the pupil and the retinal fovea or area centralis. Thus, alignment of the optic axis with the visual axis maximizes image quality in the fovea or area centralis (Figure 1). The Allman-Pettigrew model posits that orbital convergence is correlated with convergence of the optic axes on the visual axes (Figure 2), providing improved image quality in nocturnal primates. Another way to ensure high-image quality across the retina is to restrict incoming images to the paraxial region of the dioptric apparatus. This can be achieved by decreasing diameter of the pupil, but this option is not available to nocturnal animals that must maintain large pupil sizes in order to maintain image brightness. Consequently, nocturnal animals can only improve image quality in the area of visual field overlap by optic convergence (Figure 2). This suggested to Allman (1977) that if the first primates had high degrees of orbital convergence, then they were probably nocturnal. Convergence of the optic axes on each other increases the size of the region of visual field overlap (Heesy, 2004; Ross, 2000), something that Cartmill hypothesized was advantageous in the pursuit of evasive prey. Figure 1. Diagram of eye illustrating the relationship between image quality and the orientation of the optic and visual axes. The optic axis is the axis of the dioptric apparatus (i.e., the primary refracting surfaces of the eye, the cornea, and the lens). 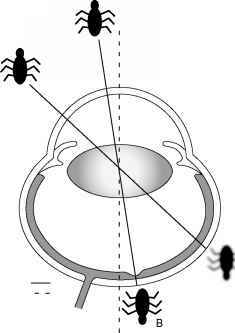 The visual axis is the "physiological line of fixation" (Walls, 1942: 292), approximated by a line intersecting the center of the pupil and the center of the region of the retina which the animal directs at objects of interest, and in which the animal has the highest visual acuity. 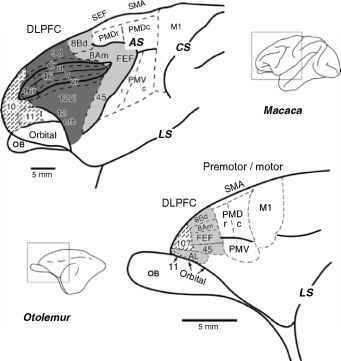 In all mammals this region is the area centralis, and in haplorhine primates this region also contains a fovea. Image quality is highest for paraxial images or images close to the optic axis and deteriorates with distance from the optic axis. Image quality and visual acuity are maximized when the visual axis is close to the optic axis (A) Image quality and visual acuity are decreased when the visual axis is divergent from the optic axis. (B) Image quality and visual acuity are increased when the visual axis is close to the optic axis. However, nocturnal animals also benefit from visual field overlap because it increases sensitivity to low-light levels, the eyes effectively having double the chance of registering a photon from any part of the binocular visual field. This improves the signal-to-noise ratio of the image, and improves contrast detection (Lythgoe, 1979; Pettigrew, 1986). Thus, optic (and presumably orbital) convergence provides two advantages to nocturnal animals: improved image quality, and increased image brightness in the binocular visual field. Figure 2. Diagram illustrating relationship between orientation of optic axis, visual axis, and orbits in a plesiadapiform-like animal with divergent orbits (left), and a primate with convergent orbits (right). The retinal images of objects in the binocular visual field (in front of the snout) are of lower quality in the animal with divergent orbits than in the primate. This is because the visual axis is less closely aligned with the optic axis in the animal with divergent orbits. What is the advantage of orbital convergence?